Enjoy this fun Thanksgiving Craft! This craft is a fun activity that can double as a bulletin board or classroom decoration. Students cut out and color the turkey body and feathers. 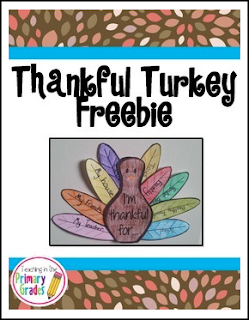 Students then write things that they are thankful for on each of the feathers. Follow my page on Facebook to be notified when I post more freebies. Thank you for your purchase! I love sharing my ideas with my fellow educations. © Copyright 2014. Jordan Piacenti. All rights reserved. Permission is granted to copy pages specifically designed for student or teacher use by the original purchaser or licensee. The reproduction of any other part of this product is strictly prohibited. Copying any part of this product and placing it on the Internet in any form (even a personal/classroom website) is strictly forbidden. Doing so makes it possible for an Internet search to make the document available on the Internet, free of charge, and is a violation of the Digital Millennium Copyright Act (DMCA)."